Ok well the title starts it out pretty well. Lisa (my girlfriend) bought this car about a year ago, at that time it was a pretty much stocker used car. With Very High Mileage, over 300,000kms that is around 200,000 miles on it. The previous owner was a car alarm and stereo installer and used it as his work vehicle. So you can imagine the shape of the interior when she got it. The dash corners were not only just broken the entire passenger side corner was gone, due to his tool box being tossed in and out of the car. Electrically the car was very sound. He had installed an alarm and stereo system with all the bells and whistles. Keyless entry, Keyless Trunk, Extended range remote pad with antenna, only thing it did not have was remote start. The stereo had Kenwood 4x10's in the dash with a top line head unit and 10 disk CD stacker behind the passenger seat. 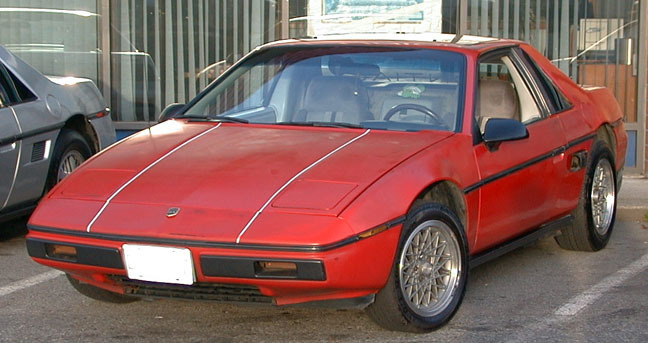 We had been looking for a fiero for Lisa for quite some time, we knew that with my garage full of spare parts and a bit of time we could get a fixer upper and have fun with it. This was just the car we wanted. 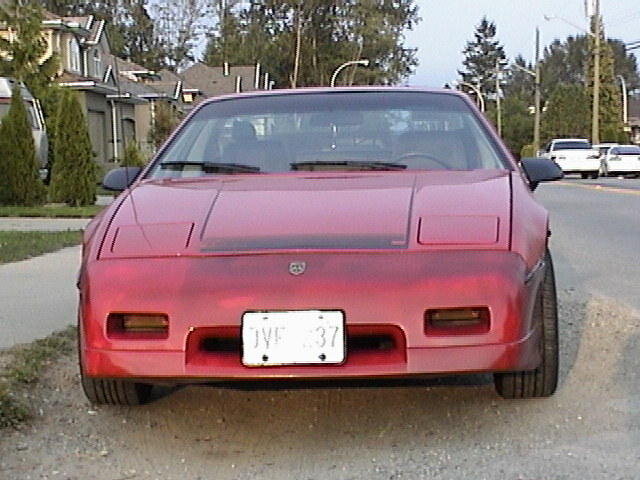 The seller let us have it for 1200$ and included a set of 86GT Lace Wheels. With the extremely high KM it needed a bunch of suspension work but drove nice for what it was. 2 weeks after getting the car, she drove it into the driveway with a ROD KNOCK!!!! After a few min of cursing the car for breaking, I told her to pull it into the garage and we proceeded to pull the motor. (Yes she helped) It just so happened that I had bought an 86SE V6 parts car, that had been rebuilt and then 2 weeks later, ran head long into a telephone pole at 50mph. The 86 had a rebuilt V6 with what we think is a mild cam installed. It took some time and a few friends coming over to help get it all done, but the car was back on the road and running real strong. Now it was time to fix all that interior that was in rough shape. First up was the Dash, Gauges and install of an Aux Gauge Pod. That really helped with the looks. The factory 85V6 gauges resemble the 4cly gauges and just don't look that good. So with the addition of 86 back light gauges and aux gauge pod the car was starting to take shape. She began to get board with the T-Handle on the auto so we picked up a late model GM top button shifter. (most gm shifters on auto will interchange through out the years. Ok Tires, and Body. She really hated the 85SE Back End and Nose, as it looked like an 84coupe. Through some wheeling and dealing we got a nice late model 86V6 rear bumper and an 87GT nose. She did the rear bumper sway herself and I did the front bumper as well as replaced a bad headlight motor. So the car was really starting to take shape now. But the tires were getting a bit tired and she wanted to tighten up the suspension, so we started with a pair of 205/50/15's in the front and 205/60/15's in the rear. They are pretty close to the stock 215/60/14 for ride height but also give the front a slight rake to it. Next up was Suspension and man did it need it. The entire front suspension was worn out. We installed new upper and lower ball joints, new upper control arm bushings and a new rack and pinion unit. Then got the car to the alignment shop to set it all up, finally the car drives nice. We are beginning to think that she has a 3.08 ratio trans in the car, as in drive at 65mph it is only turning a quite 2800rpms. 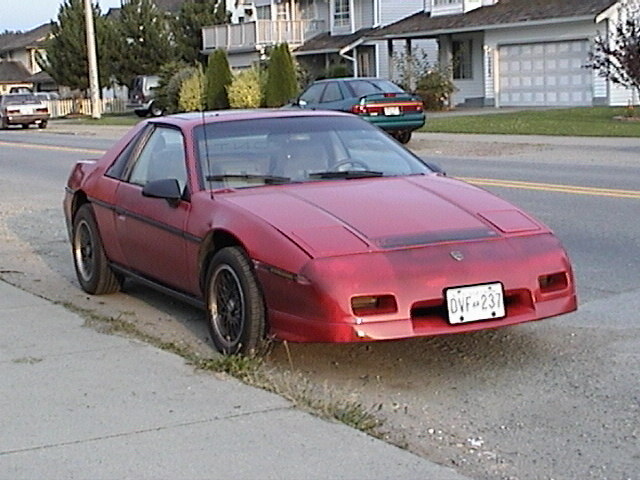 Well that is pretty much the story on Lisa's First Fiero!!!!!! In the left hand bottom corner you can see my car in the garage under construction for My new motor and 4spd stick swap.